Madrid, Spain, 2018-Jul-24 — /Travel PR News/ — Promoting a greater engagement of the tourism sector with sustainable development is the main objective of the Tourism for SDGs Platform. 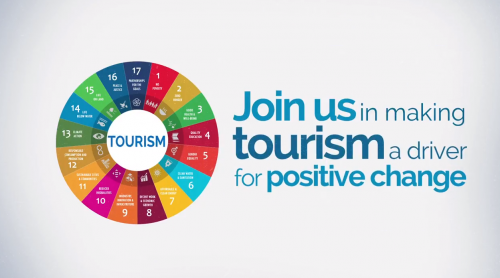 The online tool is designed to advance the achievement of the Sustainable Development Goals through tourism, and was developed by the World Tourism Organization (UNWTO) with the support of Switzerland’s State Secretariat for Economic Affairs (SECO). This entry was posted in Tourism, Travel, Travelers and tagged online_tool, Raymund Furrer, SDGs, SECO, sustainable, Sustainable_Development, Switzerland, tourism, UNWTO, Zurab Pololikashvili. Bookmark the permalink.